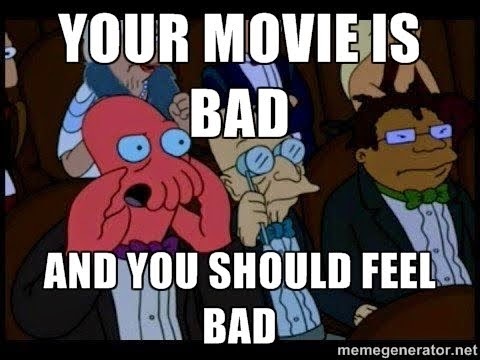 Your Movie is Bad and You Should Feel Bad: It Has Begun! In the tradition of two great writers of criticism here on our Internet, Fred Clark of Slacktivist and MaryAnn Johanson of Flick Filosopher, this blog will take an intimate look at the novel Twilight. Hewing closely to the example of Mr. Clark, I will post weekly analyses of a small section of the work, probably around five pages per week. As the copy of the book I’m holding in my hand consists of 498 pages, this will take a while. However, I have a lot to say, so the chances of remaining within my five-page limit are quite good, I think. Why, you may wonder, would I choose this novel in following Mr. Clark’s lead? After all, it is outclassed—in terms of being badly written and morally reprehensible—by Mr. Clark’s choice, the Left Behind series. Nor can I come to it with quite the same insider knowledge that he can, as I’m nowhere near the target audience for this work. Indeed, as a former PMD, I might be more of an insider in regards to Left Behind. The answer, simply put, is that this novel and its sequels have been tremendously influential, even more than Left Behind, having reached an enormous number of young people. Further, though it may pale in comparison to the appalling immorality put forth as a model in Left Behind, I do feel that Twilight is a dangerous and dehumanizing piece of misogynist hokum, and I cannot in good conscience allow it to be passed on to young people without a dissenting voice. Thus, uncovering the book’s sexism is the primary aim of the present work. The post looking at the first few pages will appear next week. Before that, I’d like to present a few general thoughts on the book and how I intend to approach it. First, as noted, it’s not nearly as terribly-written as many of its detractors have claimed. Author Stephenie Meyer’s prose is generally workmanlike, eschewing for the most part the hilarious purple prose of the worst bad writing. The book does, in fact, have a plot, and it does have characters rather than the same character filling different roles with different names. However, having said that, it is badly written. It reads like a first draft by a neophyte author (as it probably is) that, inexcusably, the editor didn’t bother to revise. Anyone involved in the business knows how much impact an editor can have on a published work, and I get the impression the publisher took one look at it and decided that, as a work aimed at ‘tweeners, it wasn’t worth bringing in a good editor to work on it—or, perhaps, any editor at all. Meyer commits one of the cardinal sins of fiction writing, which Stephen King complains about in his excellent On Writing (a book whose advice King himself stopped following in 1995, despite his having published it in 2000): overuse of adverbs, particularly in dialogue. It’s unbearable at times. Nearly every piece of dialogue is not spoken but instead spoken -ly: nervously, quietly, contemptuously, etc. etc. ad nauseum. As King noted in On Writing, if your work has done a good job in a given scene, there’s no need for adverbs. The reader should know that one character is speaking to another with contempt from the relationship between the two characters and/or the situation they find themselves in. If you have to add ‘contemptuously’, it usually means something is lacking in the context. Of course, even the best writer doesn’t dispense with adverbs entirely, but they should be used sparingly. When in doubt, drop them. Less is usually more. So, I will try to keep to a minimum my annoyance at the almost malevolent overuse of adverbs, but it will occasionally peek out. The entire blog won’t be beating up on Mrs. Meyer’s writing, but egregious examples of badness will certainly get a mention. Second, the occasional post will deal with Mormonism. Why? Yes, the author is a Mormon, but that in itself isn’t enough to warrant attention. Rather, like that of Tolkien and King, Meyer’s religion informs her writing. Some of the characteristics of the book are, I believe, reflections of Meyer’s religious upbringing and her continued profession of the Mormon faith. In fact, one could view my treatment of Mormonism as a tribute to Meyer, since I’m arguing that she does not merely appropriate the label (see below) but has internalized the religion such that it comes out in her writing in ways she probably wasn’t consciously aware of. She is no village worthy, but one who has her faith written on her heart. Finally, I do have one personal grievance, and this ties into the only "insider" information I might have: Twilight claims to be a vampire story, but it isn’t. I’m a horror fan (and a fan of its cousins science fiction and fantasy), and have been so since I was very young, when I have my first distinct memory of seeing a film (Silver Bullet, if you must know). I grew up on a steady diet of terrible Friday the 13th and Nightmare on Elm Street sequels, envisioned myself as a member of the Monster Squad, and in middle school considered Cujo the finest piece of literature ever constructed. My father gave me a talking Freddy Krueger for my birthday. Twilight commits one of my cardinal sins: It takes the prestige of a given label without paying the respects due that label. In other words, Meyer calls her characters vampires without even giving lip service to the immense lore that she is calling upon to lend weight to her story. I don’t appreciate people appropriating a label for the benefits that come with it while ignoring the drawbacks. (Hence my decision to drop the label ‘Christian’ once I’d puzzled out that I didn’t buy the whole Jesus thing.) Meyer takes advantage of the immense appeal of the vampire myth to sell lots of books, but her "vampires" are even less vampiric than Anne Rice’s. If you’re going to borrow the cultural impact of vampires, you have to work within the constraints that come with them. If you don’t want to work under those constraints, create your own monster. You can push the constraints a little, but if you abandon them entirely, then you’ve in effect created your own monster while stealing the cultural cred that comes with an established label. While I enjoyed the movie post better overall, I love that you (seamless-ly!) worked in "She is no worthy, but has her faith written on her heart." three gold stars for that. You can find some clarifications about Buddhism and asceticism here: http://www.answers.com/topic/asceticism. Monasticism is not THE ideal way of life, it is just a way of life. In fact, there are very strict rules and it is an arduous process to become properly renunciated. As for vampires, I do agree that they deserve better! Keep this up. Twilight: What are Little Girls Made of?